Jeremy Clarkson's jowl-slapping spin around the Top Gear test track introduced millions of car enthusiasts to the wonders of the original Ariel Atom. The company markets their cars with the slogan "No Doors. No Screen. No Roof." Don't even bother to ask silly questions about options - there aren't any. No stereo, no climate control system, and definitely no map light. All you get is pure, unadulterated performance. It looks like the handful of crazed souls at Britain's smallest automaker have been busy concocting their latest "old fashioned race car" - the Atom 500. They've managed to stuff a 500 HP dual hayabusa V8 between the rear wheels, offering double the power of the previous model. Ariel Motors have included just enough stuff to make it street legal, although you'll probably resemble Darth Vader with your full-face helmet providing much needed protection from the elements, road debris and the occasional slow moving rocket ship. The original Atom was priced around €35,000, expect to pay substantially more for this little bullet. Still, it will no doubt remain one of the least expensive supercars on the road. Honestly, I'd be terrified to strap myself into this thing since it's little brother was capable of zero to 60 mph in a tad under three seconds. I can only imagine the damage this new beast will inflict on Jeremy's ugly mug. Trust the Japanese to combine the old-school mechanical charm of a player piano with modern electronics. 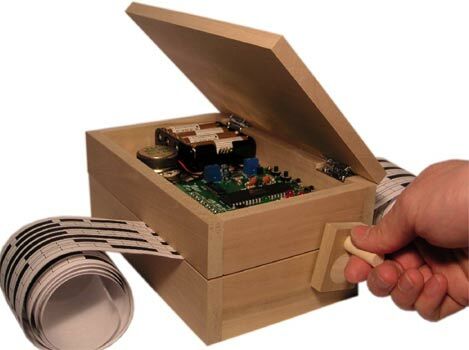 Elekit's Otokibako is a hand-cranked electronic music box that plays melodies from paper rolls using optical sensors to detect the black "notes." It offers a 3 octave range with 8 different playback tones and 15 pre-installed melodies. The wooden case just screams "paint me up!" and the experimental possibilities seem mind boggling. I might finally have found a good use for the waxy paper found in public washrooms. I found the Otokibako while surfing the Elekit site, which is packed with beautiful vacuum tube amplifier kits, humanoid robots and all manner of odd electronic gadgetry. The English version of their site seems woefully incomplete, but you can always try you luck with a Google translation of their Japanese pages. It seems like there's no limit to just how miniature our audio and video devices can be these days. You may remember when we reviewed the MobiBlu MP3 player that's a 1 inch cube with a video screen on one side. That's a bit small to watch comfortably for any length of time, a complaint I'm hearing about the tiny iPod Nano's screen. It's difficult to watch long videos at such tiny proportions. The video above shows one user's clever take on the problem. He hacked an old 35mm slide viewer, added a pair of internal speakers, and now his Nano is part of a mini-media center. 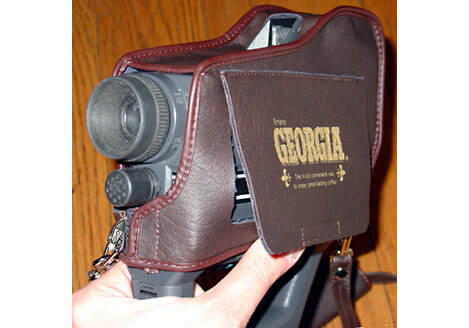 It's a clever solution, and when he opens the case so you can see what's doing inside, it almost looks as if the slide viewer was born 30 years ago just to house the iPod. A story about Retro Thing and about my thrifting career just came out in the pages of The Suburban Life - a magazine that serves some 60 Chicago suburbs. 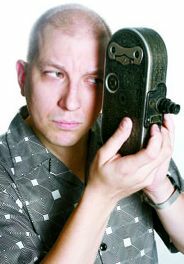 In the interview we talked a lot about growing up in suburban Berwyn, and what it means to me to chat with all of you about the fun stuff that has made our lives a little more interesting, and a little more retro. Thanks to Ann McArthur for writing the article, and for getting what we're about here at Retro Thing. You can check out the article online - I think that you might enjoy my survival tips when thrift store shopping. 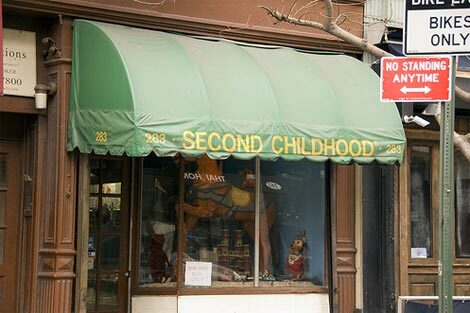 Would you enjoy reading posts about adventures in thrifting retro treasures? Any more thrift store/crate digging/dumpster diving tips that you can think of? You've got to hand it to Sony -- they've got their sticky mitts in everything, as their newfangled $149.99 PS-LX300USB turntable illustrates. As you might guess (or not) from the model number, this sucker includes a USB connection that lets you transform all of your old Duran Duran, Tangerine Dream and Ozzy LPs into the pristine digital domain. Never mind that analog purists decry the act of converting lush, warm analog fuzziness into brittle, thin and unsatisfying digital audio... that's a battle to be fought another day. 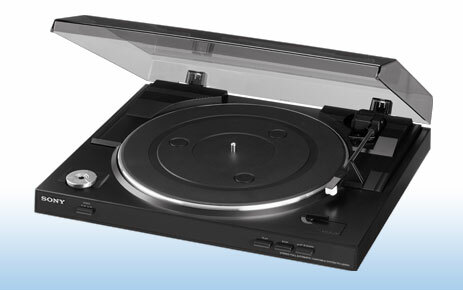 The Sony staffers were obviously at a loss while writing ad copy for this thing, remarking that "the PS-LX300USB USB turntable is also a fully functional turntable that can connect to your current system and playback your vinyl albums..." Uhh, yeah. It offers all the usual home turntable capabilities - a 33/45 RPM belt-driven platter, semi-automatic operation, early 1990s styling, and stereo analog outputs with old-school "greater than 50 dB signal to noise ratio." Hey, how come you haven't joined the zillions of others who've added Retro Thing to their feedreader? All you have to do is follow this link. There's no commitment and no salesman will call. What's that? You don't trust those newfangled feedreaders? We can relate to your healthy distrust of modern technology. That's why Retro Thing updates are also available by old fashioned email. 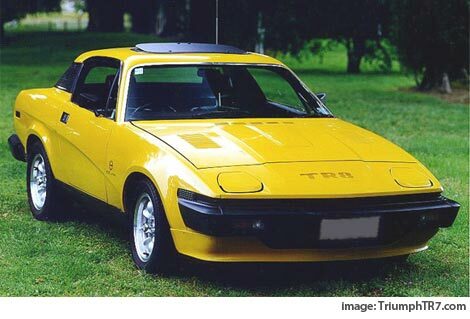 John Clancy - long-time TR7 owner and rabid film buff - has researched the history of the infuriating yet beloved TR models, from early concepts through the end of production. The result is "Code Name: Bullet - The Story of The Triumph TR7 & TR8," a unique DVD featuring previously unreleased footage from numerous sources, including some rare archival material. "The tale begins with Triumph itself - the origins of the company, the links to the Motorcycle manufacturer , the purchase by Standard and it being swallowed up by the monolithic (and patently sick) British Leyland corporation." The disc goes on to explore factory mock-ups, featuring commentary from TR7 designer Harris Mann as he discusses everything from targa-top ideas to the vehicle's distinctive and troublesome pop-up lights, along with rally footage. When unveiled in 1974, the TR7's wedge shape was revolutionary. Unfortunately, build quality was often less than stellar (to put it politely) and it was offered with an underpowered 2.0L slant-4 engine. Most important to TR purists: there was no soft-top version at first. Production ceased in 1981, but I think the TR's styling has aged remarkably well. The single disc version of Code Name:Bullet is available for £15 plus postage, and there's an exclusive 2 disc set for members of the TR Driver's Club that includes footage shot at the Club's National Weekend over the past few years. 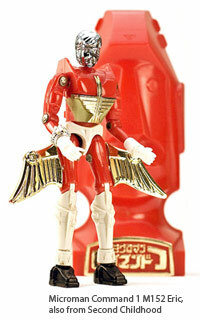 The story follows the adventures of young Johnny who discovers a massive flying robot in a hidden island base. The inventor bequeaths the Egyptian Pharoah styled robot to the boy, giving the child a radio watch to control the massive automaton. The robot's extraordinary design concealed rockets and guns in nearly every orifice - missiles even shot from his fingertips! 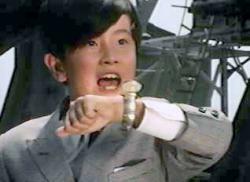 Every episode pits the robot against giant monster-of-the-week (I remember one being a giant eyeball...) to save the people of a toy-sized Tokyo. The show's human sized bad-guys are agents of Gargoyle: decked in skull-embroidered berets, 60's Italian sunglasses and beatnik beards. Get this... these evil agents have explosive implants that are set off in case of capture. Whoa. The complete 26 episode series has been issued on LaserDisc and DVD in Japan, but never here in the US (though a revival animated series from the 90's is readily available). 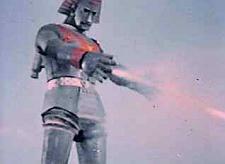 Luckily for Chicagoans, the next few weeks will see a new classic TV station - and Johnny Sokko is on the schedule! 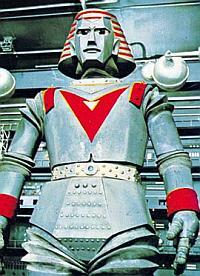 I may be more excited about Giant Robot coming on TV today than when I was in my formative geek years. 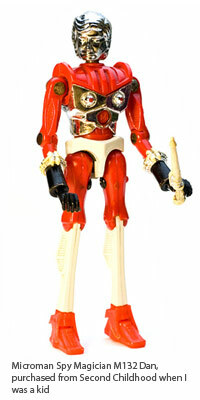 Lost In Space robot can be yours! During its astonishing 10+ year lifespan, the Atari 2600 console went though several product designs. The early woodgrain clad versions from 1977-81 are the ones that many of us are most familiar with. 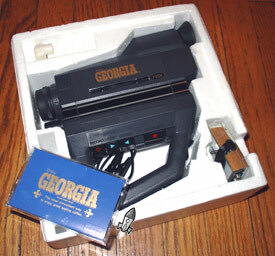 1982's machine was still the same shape, but in all black plastic. This console was the first Atari unit to actually bear the name "2600" (though fans refer to it as a "Vader"). 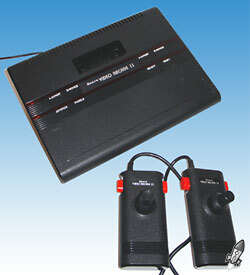 In 1983 Atari created the 2800; a sleek wedge-shaped version of the 2600 for the Japanese market. The unit has soft touch face controls, lots of red LED's, and unusually shaped controllers that serve as both joystick and paddle. 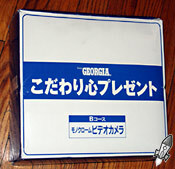 The unit didn't sell very well in Japan, this being at the dawn of Nintendo's Famicom juggernaut. 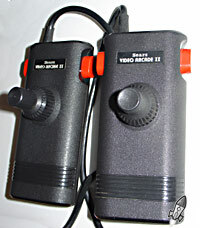 Back in the US, the 2800 was marketed by Sears as their "Video Arcade II". Atari re-used the 2800's design for their more advanced 7800 game system in 1984 (which didn't hit store shelves until '86). 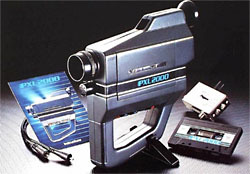 Atari then introduced a low-cost VHS sized 2600 "junior" console as an alternative to the increasing number of game systems in the late 80's. While the cool look and the comfortable controllers of the 2800/Arcade II do make it a worthwhile addition for the serious video gamer, it also shows an Atari desperate to stay alive in the mid 80's. For Atari to remain relevant when faced with the specter of new kid Nintendo, they probably should have concentrated on creating better games instead of just putting a new coat of paint on their old warhorse. Like many world-wide classic brands, ChapStick had humble beginnings at a family-run business. Dr. Charles Browne Fleet plied his trade at the sweet end of the intestinal tract (you may recognize his name from the famous enemas he developed) by creating the first lipstick-shaped balm in the late 1800's. Starting in 1912, the manufacturing rights were sold to a number of companies until ending up with current holder Wyeth. 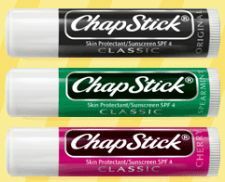 1971 saw the first flavors introduced, and now ChapStick is part of a sprawling line of lip care products. This year Wyeth has even brought back the "classic" style packaging that I remember constantly being in my father's pocket. 1972 saw the ubiquitous ChapStick pressed into service as a spying tool. 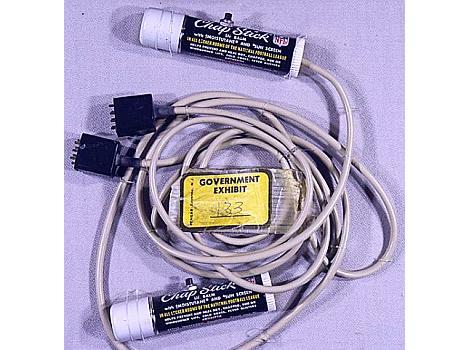 ChapStick tubes were modified with hidden microphones and were used by G. Gordon Liddy and E. Howard Hunt during the time of the Watergate break-in. I couldn't find any details of how exactly to use these microphones - I'm guessing that the operator would hold them in his hand with the wires running up his sleeve. If you look closely, you can see a pushbutton on the body of the ChapStick, which must be a clue. I'm guessing a push-to-talk button like on a walkie-talkie. Loose lips might sink ships, but at least they won't be chapped while doing it. Bongo drums are one of those cliched images of “retro” thanks to their association with the 50’s – 60’s Beatnik scene. Watch any sitcom from that time, and I'll bet you see at least one Beatnik moment - bearded guys at a coffee house poetry reading, with silent moments punctuated by bongo hits. 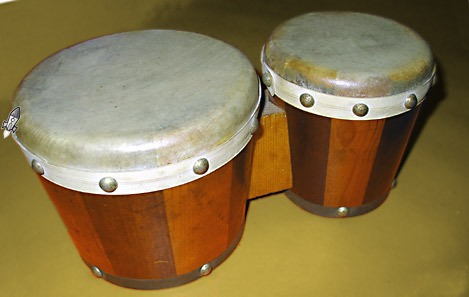 Bongos remain an important part of Latin music and Latin culture (and let’s not forget their recent turn as a controller for Nintendo’s Game Cube). These bongos are an old set that I inherited – probably bought as a souvenir while visiting our good neighbors south of the equator. The skins on it are dead, dead, dead. Despite this, I have used these congas in recorded music, but I won’t pretend that they sounded very good. Perhaps these were only ever made to be a souvenir as it looks like it would be rather difficult to replace the drum heads. 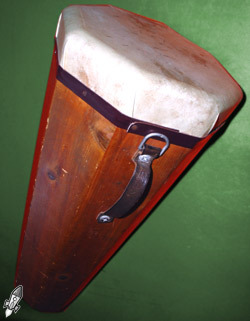 I’ve got another Latin percussion “souvenir” – an unusual octagonal conga drum. I don’t know if it’s technically correct to call it a conga since there are many classifications for a long handheld drum like this. It's got a handle, it looks like Ricky Ricardo's drum... so I'm saying it's in the "conga" family. The weird shape has earned it the name "octa-conga"
Because of its size, I’m guessing that it’s more decorative than rhythmic. Good thing too as the skin on this one is even more dead, and looks even more difficult to replace. Now where am I supposed to find an octagonal cow? The thing I've collected for the longest time is probably sound effects records. Ever since childhood, I loved putting FX records on and just imagine being transported to all kinds of places. It also made me aware of just how different "Ford Triumph Door Slam" and "'48 Packard Door Close" could sound. Sound effects records usually fall into two categories. 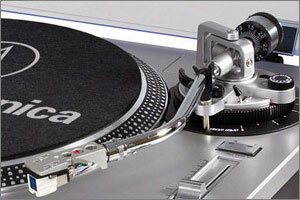 Some records have discrete sound effects for you to plug into a movie or audio project. Other records create a whole atmosphere, be it a haunted house or a gentle brook. This record is an oddball combo of the two. 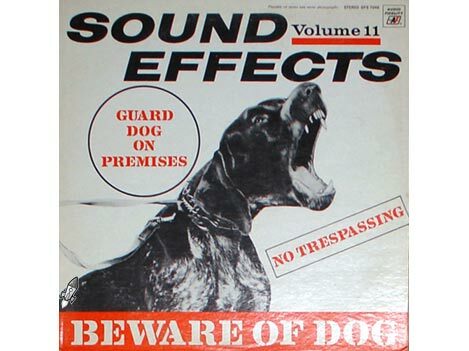 "Beware Of Dog" was published by Audio Fidelity in 1971, a label that put out dozens of SFX records for decades (they were also the first label to release a stereo record commercially). Most have individual sound effects, though some are soundscape records - railroad trainyards, nickelodeons. This record devotes each side of the LP to 20 minutes of a mean-sounding dog (sometimes a few) barking. "This unusual recording presents ... a watchdog at work, reproducing the full-throated sounds of savage vigilance in a surprisingly varied and completely real 'performance.' ... It could serve... in your absence to provide your home or apartment or automobile or office with a convincingly realistic guardian, as the repeated sounds strongly suggest to passerby or would-be intruders that they Beware Of Dog." "Automobile"? For all those people with record players in their cars? Car thieves are going to run away from the sound of a giant invisible dog? Using the record to guard your house might have a chance of working, I guess, though the cavernous stereo-era reverb might tip off the bad guys.